How does one review a book like Tortilla Flat – a book so full of life and love and joy that it almost makes you weep? And yet the book is about a group of winos who band together for protection and company – and I’m not sure I’d want much to do with these guys in real life. Set directly after WWI, the book takes place in the sea-side fishing town of Monterey, California where Mexicans live peacefully amongst whites and other ethnic groups. 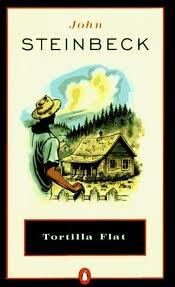 The protagonist, Danny, has just returned from war duty herding mules in Texas to find he has inherited two houses. Being a property-owner changes him somehow but he goes with the flow, inviting his friend, Pilon, to rent the second house. Pilon is a natural-born schemer and rents his house to another friend, Pablo. Before you know it, three other old friends have joined the group. Pilon’s house burns down so the friends all move into Danny’s house. So begins the life of Steinbeck’s vision of Monterey’s King Arthur and his Knights of the Round Table. Each of these characters, Danny, Pilon, Pablo, Jesus Maria Corcoran, Big Joe Portagee and the Pirate, is distinctly developed with his own unique personality and behaviors. The interplay between the characters and the community of Tortilla Flat is fascinating and insightful, hilarious, pathetic and inspiring. The book is short and all the events take place in just a few months. Danny gets his houses, the friends find each other and move in together, scavenge for food, and take part in little “quests.” They require very little for their own happiness, a bit of food, a jug of wine, companionship, a lady once in awhile and some kind of cover for night. Danny as the owner is the decider and has some responsibility which doesn’t suit him – his boundary is his bed – no one sleeps in Danny’s bed. Pilon always has good motives but falls short of living up to them – there’s a good Pilon and a bad Pilon. Pirate is so simple that he doesn’t recognize the group has designs on his own little stash so he entrusts them with it. Jesus Maria Corcoran is extraordinarily helpful. Pablo learns lessons from everything and Big Joe Portagee is along for the ride as long as he can stay out of jail. Steinbeck calls his little group the “paisanos,” and romanticizes the poverty and criminality and drunkenness by viewing it through the rose-colored lens of friendship and the simplicity of life. He lifts them out of a stereotype with the use of some archaic language like “thee,” and “thou,” and aligns them with King Arthur as well as Robin Hood. Women have no real place in their world view – they are on earth to be helped and loved and used and left. http://en.wikipedia.org/wiki/Tortilla_Flat has an excellent summary of the connection to King Arthur. The landscape of Monterrey with a bit of forest and the ocean and the air emphasize their naturalness and simplicity. Their religion is that of simple people – no theological issues – only protection, miracles, and mystery. I think Steinbeck was so much better in his early years when he wrote about the poor people of California. He loved them and gave them a certain human dignity.